Jasper National Park is the largest of Canada’s Rocky Mountain Parks and part of the UNESCO World Heritage Site. Jasper spans 10,878 square kilometres (4,200 square miles) of broad valleys, rugged mountains, glaciers, forests, alpine meadows and wild rivers along the eastern slopes of the Rockies in western Alberta. There are more than 1,200 kilometres (660 miles) of hiking trails (both overnight and day trips), and a number of spectacular mountain drives. Jasper joins Banff National Park to the south via the Icefields Parkway. This parkway offers unparalleled beauty as you travel alongside a chain of massive icefields straddling the Continental Divide. The Columbia Icefield borders the parkway in the southern end of the park. Why not drive through this magnificent landscape on World Discovery’s classic ‘Canadian Pacific’ itinerary? Canadian carrier WestJet has announced the introduction of no less than 6 new routes from London Gatwick, starting on May 2016. With fares starting at around just £100 one way to St John’s Newfoundland, the new flights will make Canada more accessible and more affordable to thousands of UK passengers. Destinations to be served are Toronto (daily), Vancouver (6 days a week), Calgary (5 days a week), Edmonton (2 flights a week), Winnipeg (once a week) using new Boeing 767-300 aircraft. These planes seat 262 guests and have a range of approximately 11 hours. The flights to St John’s (daily) will be aboard the smaller Boeing 737-800 planes. “We’re taking the same approach to our London flights that we brought to air travel within Canada 19 years ago. That is, we find ways to keep the fares low, and give you control of what you pay for” said a WestJet spokesman. As well as the main cabin (238 seats witha 2-3-2 configuration), there is also the excellent Plus Cabin, which has wider seats arranged 2-2-2 with increased legroom and a deeper reclind. WestJet maybe a ‘no-frills’ airline, but it offers a more complete service than other competitors in the category. Even in the main cabin there are complimentary light snacks and non-alcoholic drinks, with the option of purchasing more substantial snacks and meals. 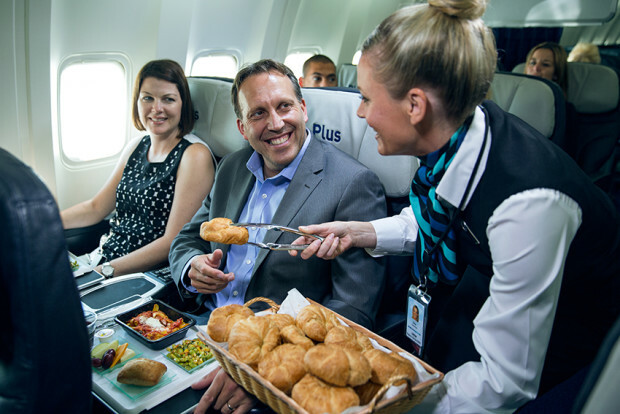 In the Plus Cabin (pictured left) you will enjoy a welcome drink, hot towel service, and hot meals served with wine or beer (except on the flights to St John’s, where hot food is not available – a premium meal box will be served instead, complete with deli-style sandwich, dessert and beverages). There are few things more enjoyable on a flight than kicking back and watching a few of your favourite movies or perhaps one you’ve never seen before. 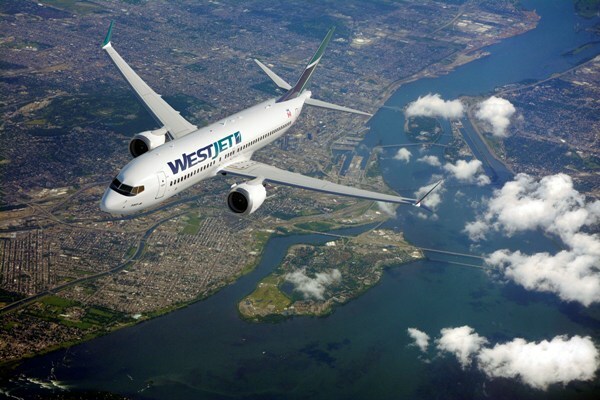 WestJet Connect, the airline’s new inflight entertainment and connectivity system, houses hundreds of on-demand movies and TV programmes, and live TV channels you can enjoy at no extra cost. There will also be a selection of premium movies and internet access available for a fee. WestJet Connect is streamed via the WestJet app on your smartphone or tablet, or to your laptop. There are USB outlets at each seat in the main cabin, and 110-volt power outlets at each seat in Plus. Make summer 2016 the time to take that Canada trip you’ve always promised yourself! Check out World Discovery’s 13 day Self-drive Nova Scotia tour from £1970 per person. 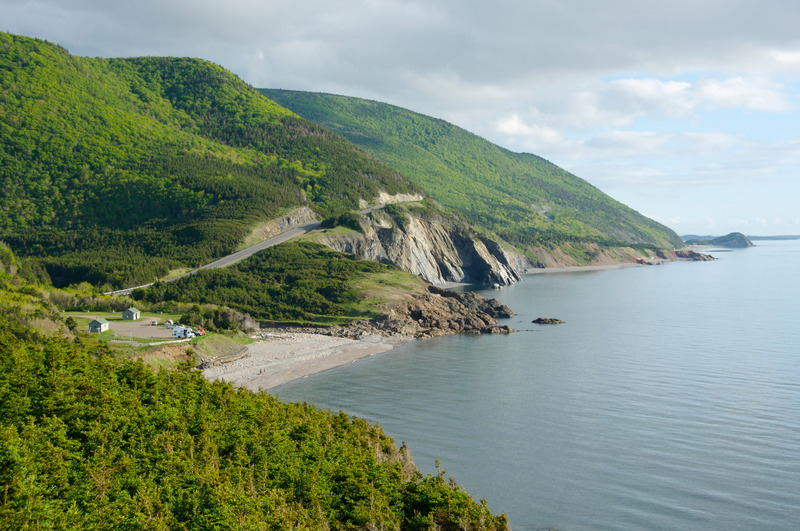 As we specialise in tailor-made holidays, this can be adjusted to your own wishes, including a longer stay in the Cape Breton Highlands National Park.